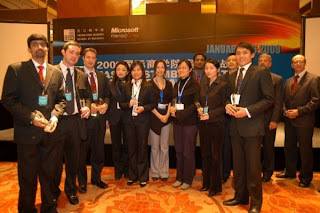 The 2009 Microsoft Case Challenge was held in Beijing from January 5-6. Muthuramen Ganesan’s team emerged as runner-up, with the chance to implement their proposed business plan with funding from Microsoft. 16 teams, 12 universities: needless to say the atmosphere was electrifying! Here we were in Beijing, to represent the NUS Business School in an exclusive “by invitation only”, non-profit case challenge organized by the Cheung Kong Graduate School of Business in conjunction with Microsoft “FirenzeChina”. We were enthralled and felt extremely proud to be the only team from Singapore to participate in this international competition. It had been hard work preparing for this contest especially given that all four of us were located in four different cities, teleconferencing day and night coordinating with each other. It all started when we heard the news of East-West All Star Case Challenge and there was a buzz all around the NUS Business School. People got busy forming teams and designing strategies. The MBA Office designated a celebrated professor, Professor Andrew Delios to select and mentor one team to represent NUS Business School for the event. He gave us an initial challenge and asked us to present our analysis and recommendations within one day. A day of slogging it out got our team of three engineers and one chartered accountant through the selection process. Excited as we were, we had little idea of the rude shock awaiting us. The case from Microsoft blew our lids off. We were asked to strategize the promotion of a Microsoft product through viral marketing and reach out to 1 million students on a tight budget. We hardly knew about viral marketing, had never heard of the product, and this budget? What a pittance!! The next few weeks were a roller-coaster; we worked day and night while Microsoft played with us throwing all the twists and turns, which they called “Curveballs”, into the challenge. After weeks of nerve wrecking effort we managed to submit our business plan, just in time. The next ten days whizzed past in getting our tickets and visas ready and packing for the chilly winter in Beijing. The main event in Beijing had two phases – Compete phase and Collaborate phase. The Compete phase involved school teams submitting their own business plan and was divided into two categories – Chinese & Non-Chinese. It was an extremely tough contest where the team from Tsinghua SEM won the round for the Chinese category while the team from Booth School of Business, Chicago (formerly, GSB Chicago) took the laurels for the Non-Chinese category. The Collaborate phase was far more exciting. The teams were all split and randomly mixed to form teams of 8, ensuring that no two students of the same school were together in any of the teams. And here was the “Curveball”: Each team was now supposed asked to market the Microsoft products to 5 million students globally. Simulating an economic depression, there was another killer: the budget was squeezed by half and the time for submission of the plan squeezed to just 24 hours. Just 24 hours to gel with 7 other strangers and come up with a new business plan! This wasn’t enough. The Program Director for FirenzeChina kept on throwing new curveballs at us, trying different things, removing some key team members from various teams randomly for a few hours, depleting the teams and challenging them to work in crisis situations. The finals were a grand setting in front of a 600 strong audience and press reporters. Here again we left our mark. Ram played a key role in one of the two finalist teams and ended as runner up. It was a tough decision for judges in the Collaborate phase finals with both the teams strong in diametrically opposite dimensions. The winning team was brilliant in presentation, while the runners up were outstanding in research and quantitative analysis. Impressed and elated by the quality of both the teams, Microsoft executives decided to award both the teams US$ 10000 to implement their respective plans. 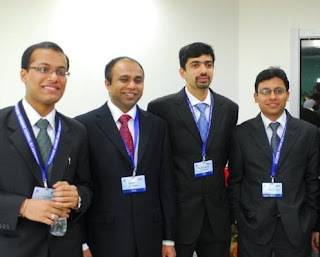 Additionally, the winning team received a cash prize of US$ 20000. Going forward, Ram will be working with his “Collaborate” team and with Microsoft executives on implementing their business plan. The plan involves marketing of Microsoft’s product and reaching 5 million students through viral marketing in India and China within the budget.The two days that we spent in Beijing will probably remain the two most exciting days of our MBA. Though we had hoped to win the contest and were disappointed at ending up as “also ran” we were glad that we had done our best to represent the NUS Business School as great brand ambassadors for our alma mater. We got a tremendous learning opportunity and we made great friends across the globe. We’ll cherish this event for a long time to come. 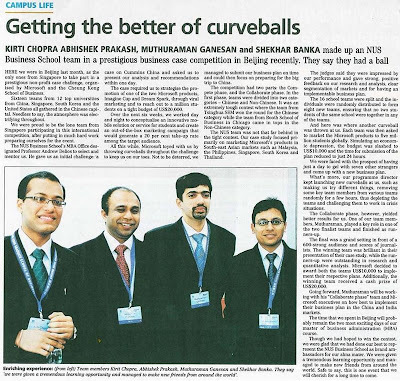 From the editor: The event was also recently covered in the Business Times.